Public services in the UK have suffered continuous cuts over the last decade. An area where this has been increasingly visible to the general public is Royal Mail delivery offices, where you go to collect post that could not be delivered. Royal Mail was established in the 16th century and has existed continuously since. For the majority of this time it has been run as a public service, and as such is required to meet publicly-monitored service standards. However, everyone I’ve spoken to about them has a story about poor service, tatty buildings or antiquated systems. The whole service could do with a customer experience overhaul. I recently used my local delivery office, and was faced with several major issues that could be resolved without the need for extra investment, but simply a review of systems and approach. You will have been informed of an item waiting for you using a red “something for you” card. Collection options include arranging a redelivery via the website or by phone, collecting it, or having it delivered to another address within the same postcode area. The information is not listed in one place; you must read the whole card to find out all your options. The cards have recently been redesigned, but many areas are still working through the stock of the old iteration. The new card is better, but there are still issues establishing what are the criteria for collection or redelivery. The new card has a QR code on it. But is this a useful choice? Are those likely to use newer technologies already served by the online redelivery form? Surely the need for more options is greater for those without internet connectivity. The cards are produced centrally, with details of the local delivery office printed by each depot. The postman is supposed to add his initials and any tracking numbers to the card – which is filled in as necessary at your door. This results in shortcuts and poor levels of care in completing the card. There is no reference number for the item – only the instruction to collect it within 18 days, after which time it will be returned to the sender. Most areas will not attempt redelivery without contact from the addressee. This seems a huge waste of resource when Saturday deliveries are available, and most people who are not in during weekday deliveries are more likely to be in on a Saturday morning. There is no recourse if you have lost the card, or did not receive one. If you don’t go to collect the item, Royal Mail simply returns it and it is up to you or the sender to resolve the issue. This does not include any recourse for instances in which the addressee is not expecting a delivery. If the card is mislaid or not received, you have no idea that there is anything waiting for you. Each poster is written in the negative: as warnings and prohibitions, rather than assistance and guidance. Inside, more posters deliver the same information in different wording, with no adherence to brand, confused messaging and poor legibility. But worse of all is the use of internal terminology. The most obscure instance of this is the use of the term “739 card” on many posters and notices. In public service organisations, there is a requirement to make access simple, inclusive and consistent. Use of internal terminology (“739 card”) and the lack of consistent messaging causes confusion and renders those not already familiar with the system at a disadvantage. Posters decrying “NO EXCEPTIONS WILL BE MADE. Requesting to speak to a Manager will not change the decision” create barriers to access rather than providing explanation or assistance. In an office where staff are already physically cut off from customers by a security counter, adding negative messages that create an “us and them” attitude is unhelpful. Another homemade poster had a hole into which was pasted a red “something for you” card (see above). It stated, “You MUST have your 739 card AND a piece of VALID ID in order to collect any mail”. It seems wonderfully counterintuitive to create a poster to explain something that could have been avoided altogether if all the other posters simply referred to a 739 card by a name that the public could recognise. You don’t have to be the addressee. You don’t have to prove that you or the addressee lives at that address. There is no record of who collected it or when. If you can’t provide a 739 card and ID, you simply cannot collect the item. On a previous visit, I have heard staff tell a customer that the item they are currently holding in their hands would have to be sent back to the USA and re-sent because one of these criteria had not been met, despite the customer having photo identification that matched the name and address on the parcel. If you can prove that you are the person to whom the item is addressed, it seems nonsensical that the item cannot be released. In another instance where the rules seem to outweigh purpose, a customer told that unless they have an ID with their online shopping account user name on it, the item can only be redelivered; not released. This may be good adherence to the ‘letter of the law’, but is reductio ad absurdum of their purpose. Thirdly, if you have moved house since the item was originally delivered, and you do not have the required ID and/ or 739 card, both staff and customers seem unclear as to what to do in order to get the item delivered. 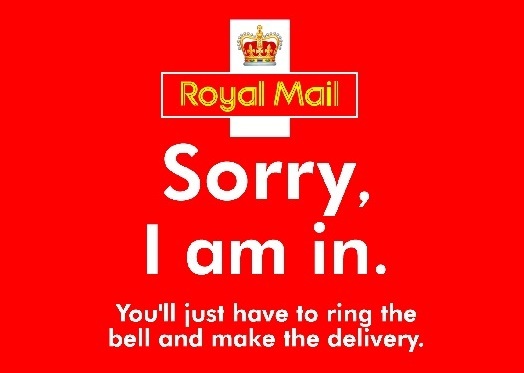 Poor service seems to be somewhat of an anecdotal joke when it comes to service at the Royal Mail and Post Office. Whilst drafting this post, I heard a story from a colleague about a member of staff mistakenly sending over £12,000 into the ether because they were more concerned about why the bill being paid was so large than correctly keying the reference number. Whilst the system could transfer the money out of the account instantly, it would take three days to process a refund and correct the error. At the delivery office, staff processed each request with the kind of lethargy I am sure contributes to the levels of conflict the posters imply. We are a fast-paced society, and living in central London, visiting a delivery office is often undertaken with little temporal leeway. Failing to meet the needs of the customer in such a basic way is deeply frustrating. Review systems and processes to ensure there is a link between the intention of the rule and the result. a. Ensure a logical link exists between the requirement to hand over the “something for you” card and ID and security. b. Mail should be well-managed so that it is recorded and can be found. c. Put a system in place that records by whom and when the item was collected in place of the card and ID system, which does not fulfil these criteria. A paper log book would suffice if a digital system is not viable. Manage customer expectations by using well-researched information. a. Research what types of query delivery offices receive in order to assess what information should be provided on “something for you” cards and on posters. b. Produce the right information centrally so that local staff do not need to write additional notices that may be confusing or negative. c. Train staff to provide information in a positive light and seek solutions to customer needs. d. Eliminate use of internal terminology in the public-facing material. Aside from the 730 card, another example is the term “delivery office” – which assumes the perspective of the Royal Mail and not the customer. To the customer, it is a collection office. Proactively offer customers for whom this is an on-going issue an alternative or additional service.